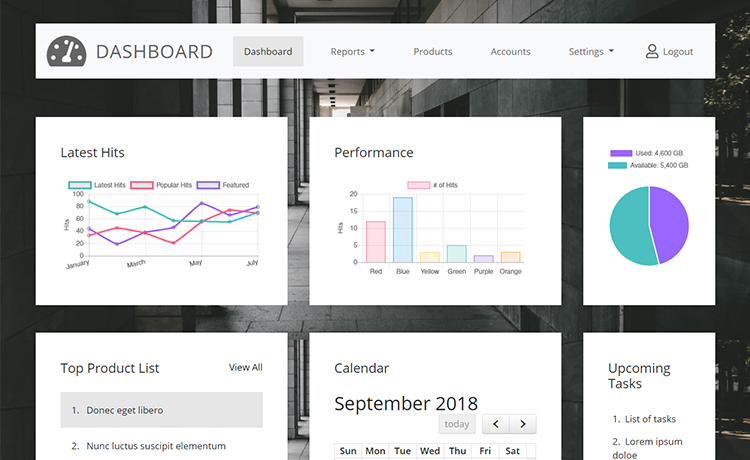 Get this free HTML5 admin dashboard template if you're looking for a simple, responsive, and easy-to-edit template. Download now and start customizing. Here’s a free HTML5 admin dashboard template to deploy in your next project. Built with Bootstrap 4, this free HTML5 template comes with a pack of ready modules and a neat structure. Besides the simple layout, you will get multiple options to organize your dashboard for a complete solution. It also has dropdown menu, products and login page, and calendar to pick a date. You can present your data through the graph and charts: line, pie, and bar. Alongside editing your profile, you can also add, edit, and upload images for products. Besides the free website templates in various categories, we also update our admin-dashboard section, regularly. Free Bootstrap templates are a great boon for the people who are about to start their awesome projects. If your business is stable and you want to take it to the next level, please get a quality checked template. Your money is totally worth it.